City Music Foundation (CMF) is pleased to announce that A4 Brass Quartetare one of the six artists joining the CMF Artist Programme as ‘2018 CMF Artists’, making them the first classical brass ensemble to join the scheme. Responding to the news, they said: "We at A4 Brass Quartet are extremely looking forward to this new partnership with the City Music Foundation and we can't wait to begin working on developing exciting projects over the 2-3 year programme as we continue to expand our repertoire and perform to new audiences across the world." 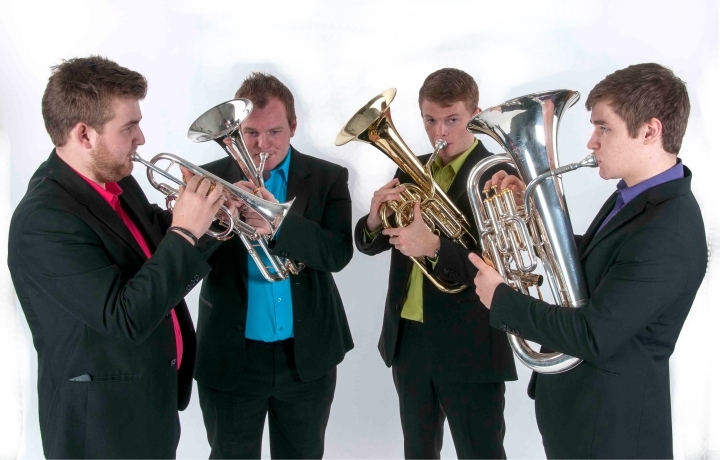 A4 Brass Quartet will give a recital, A celebration of Christmas with carols sacred and secular arranged for brass, at The Hospital Church of St Bartholomew the Less on Wednesday 19th December 2018 as part of our 2018-19 Lunchtime Recital Series. The other five 2018 CMF Artists are Helen Charlston (mezzo-soprano),Toby Hughes (double bass), Ariana Kashefi (cello), Tom Millar (jazz piano), and Emily Sun (violin). Chosen from over 150 applicants, these six successful artists were selected through a series of audition stages, culminating in a final live audition chaired by Ian Ritchie (Festival Curator & Artistic Director). Judges included Michael Collins (clarinetist & conductor), Gary Crosby (Co-Founder & Artistic Director, Tomorrow’s Warriors), Huw Humphreys (Head of Music, Barbican Centre), Mats Lidström (cellist & composer), Sebastian Scotney (Editor, London Jazz News), Roger Vignoles (pianist), and Howard Williams (conductor). CMF’s mission is to turn exceptional musical talent into professional success by equipping outstanding musicians with the tools, skills, experience, and networks they need to build and sustain rewarding and profitable careers. Through an annual competitive audition process, we select classical soloists and chamber ensembles, as well as jazz, folk, and world musicians. These ‘CMF Artists’ then engage in an innovative two-year programme, which includes artistic and business mentoring, as well as professional development workshops. These workshops cover a range of topics such as managing finances, tax and pensions, legal input on copyright and contracts, plus presentation and interview skills, promotion and publicity strategies, and much more.